Miami University’s new Alumni Veterans Tribute was unveiled Sunday, Nov. 11. The project honors Miami alumni who have served, are currently serving and will serve in the armed forces. 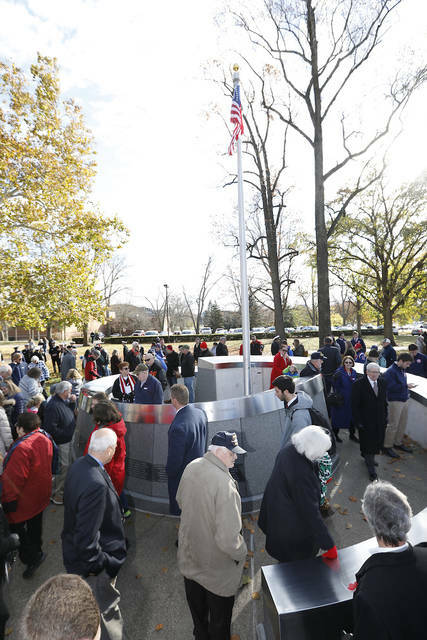 OXFORD — Miami University’s new Alumni Veterans Tribute was unveiled Sunday, Nov. 11. The project honors Miami alumni who have served, are currently serving and will serve in the armed forces. The project has two parts, one physical and one virtual. The physical tribute includes a memorial with the names of those who were killed in action or missing in action. The virtual part is a website with a searchable database of Miamians who have served or are serving. The idea for the project came from Dave Miller (Miami ’60, MBA ’69) and David Lawrence (Miami ’64) five years ago. It was guided by a committee of alumni veterans and funded through private support from alumni and friends. For Miami student and military veteran Emma Wott, this Tribute is more than a physical monument. It is an active reminder of support. “Action was taken by those affiliated with the military and those who were not. They with a means to help shed light on Veterans who feel forgotten. Instead of us having to keep looking for something, someone is instead holding their hand out already,” she said. https://www.registerherald.com/wp-content/uploads/sites/41/2018/11/web1_miami-tribute-1-_ne2018111283643861.jpgMiami University’s new Alumni Veterans Tribute was unveiled Sunday, Nov. 11. The project honors Miami alumni who have served, are currently serving and will serve in the armed forces.